As I plan my 11th trip to Thailand for 2019, my mind wanders back to my first few visits to this Southeast Asian paradise, recalling all the mistakes I made (and saw/heard that others made) while there. While I know that every tourist doesn’t make the same errors, this post may help tourists and travelers avoid more ‘typical’ mistakes, and help them have an easier and less stressful journey through this magical country. If you managed to visit Thailand without making a single one of these mistakes, congratulations! If not, don’t worry. We’ve all made a few. And if you’re planning a trip there, read on to find out some common errors tourists make and how to avoid making them. Tourist scams are prevalent in Thailand, especially in spots like Bangkok and Phuket. This post goes into much more detail on some of the most common scams and how to avoid them, but in general, be careful when taking tuk tuks, and take photos of scooters and jet skis before renting them. When in doubt, approach others with what you need, and give those who are hounding you offering services a polite ‘no thanks.’ And when someone tells you (no matter how official looking) that the Grand Palace is closed, ignore them! Taking precautions when eating in a foreign country is always a good idea. While you should stick to drinking bottled water in Thailand, by no means should you simply avoid street food. 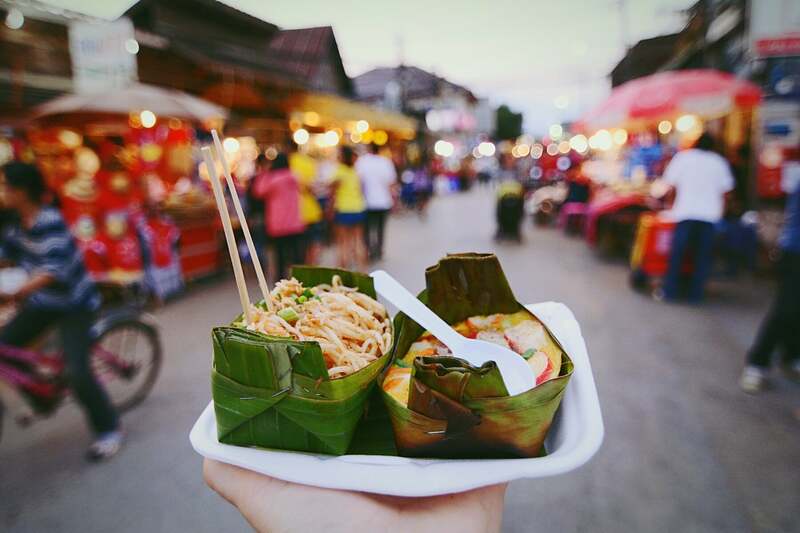 In fact, some of Thailand’s best cuisine can be found for $1 on the street. Just use common sense: if it looks like it’s been sitting out for ages or has a bad smell, skip it. A few key rules are to avoid raw veggies, be careful with ice and to ask vendors to peel new fruits or squeeze juices in front of you. When in doubt, always buy from the stall with the longest line — it’s usually worth the wait. Many seats on buses, ferries and even in airports are reserved for monks. Usually, a sign will note this, similar to ones you’ll see in Western countries reminding you that certain seats are saved for the handicapped, elderly or pregnant passengers. So, I’m going to state the obvious here: don’t sit in the seats reserved for monks. And if you do without realizing it, get up and move when you do realize, or when a local calls you out — all while sporting a sheepish, apologetic smile. While this may seem like a rookie error, I’ve heard several stories about people going to the wrong airport to catch their flight as Bangkok has two airports. The larger one you’ll fly into if coming from the US is the Suvarnabhumi Airport (BKK). The other is Don Mueang International Airport (DMK) — this is where the low-cost carrier AirAsia operates from, as well as many other airlines. 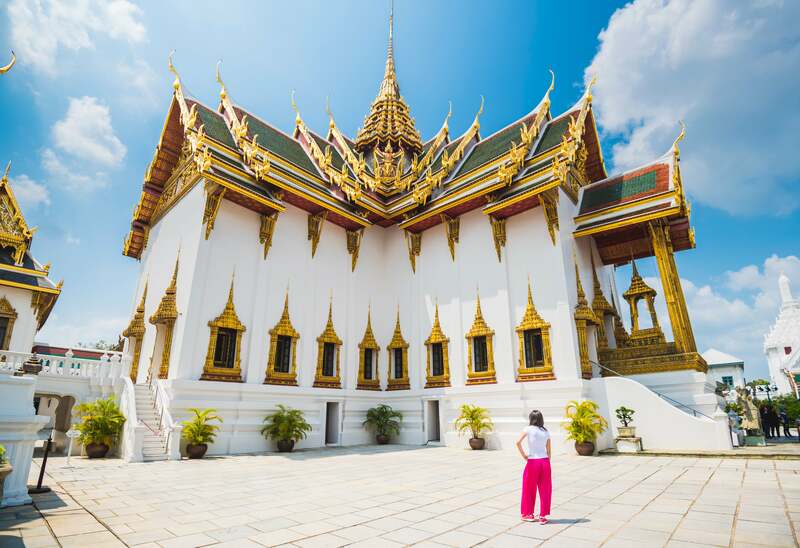 The mistake can easily be avoided by carefully looking at your travel itinerary, and not pulling an all-nighter to experience Bangkok’s epic nightlife scene the evening before your early morning flight. Most Thai people are gentle, gracious and polite. So don’t offend them. The number one way to do this is to disrespect the King. Don’t do this! Seriously. It’s a big deal there. Be respectful when visiting Buddhist temples by removing your shoes and covering your shoulders and knees. If you sit, don’t let your feet point out in front of you at Buddha (or anyone), instead, fold them to the side, underneath you or sit cross-legged. Bangkok’s traffic is insane, and using BTS, Airport Link and MRT, which are the city’s Skytrain, airport train and underground metro systems, are welcomed modes of transportation. These systems are modern, clean and heavily air conditioned, which is heaven after a sweaty morning walking around in the humid, busy city. Station attendants usually speak English and can help you figure things out, though it’s typically well-signed and fairly simple to navigate. In fact, riding the rails from the BKK airport into the city can take less time than a taxi, especially if there’s heavy traffic. The River Ferry is another mode of transportation that should be used. It takes passengers from piers near many of the fancier river hotels down to the areas near the Grand Palace or Khao San Road for less than $1. You’ll enjoy some wonderful people watching on the boat, as its frequently used by monks and locals going about their day. Don’t get the larger ferry boat confused with the banana boats that rage down the river at epic speeds — those are private, tourist-catered boats that cost much more. While tourists are spoiled for transportation options in Bangkok, having so many choices usually ensures you’ll make the wrong one. While I stated the importance of using the BTS, MTR and ferry above, it’s just as important to consider the right road transport options. Tuk tuks can be pricey, so make sure to bargain. You’ll want to take good care of your belongings inside too — swiping purses from tuk tuks isn’t uncommon. If it seems like your tuk tuk isn’t going where you want, tell the driver to stop and get out. Using an app like Grab (they recently acquired Uber in Thailand) is ideal as you won’t have to barter for pricing, beg to turn on the meter or explain your destination to a driver who only speaks Thai. When using Grab’s moto taxi feature, make sure to always ask for a helmet. If you do use a regular taxi, insist they put on the meter, or bargain a fair price if they refuse. I usually ask my hotel to insist the taxi driver put on the meter before getting in. With more than 1,000 islands, visitors have endless options when it comes to checking out some of Thailand’s famous beaches. I’ll give you a hint: if you’re looking for the most beautiful, it’s not Phuket. The country has plenty of other islands to fit any traveler’s idea of a beach vacation: pristine stretches of empty coastline, luxury resorts and hotels, backpacker hostels, detox yoga and spa retreats, party beach clubs and more. Of course, Thailand has lots of shoreline that isn’t in the form of an island, too. So take the time to do a little research to find out which island or beach is right for you. 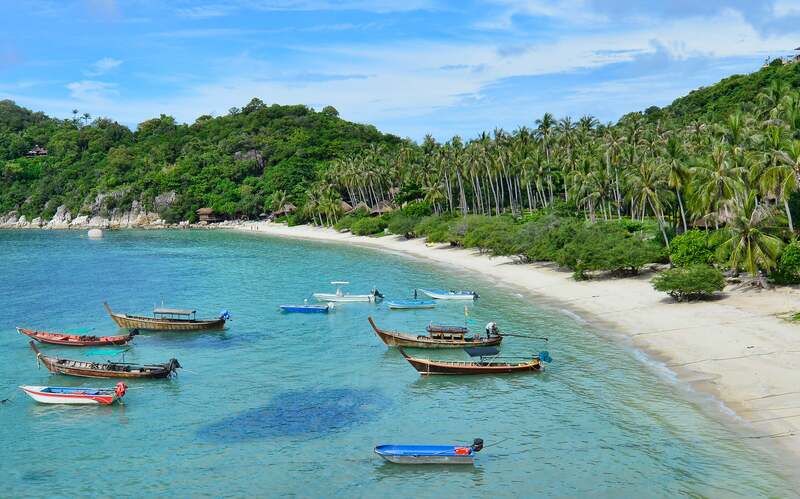 My personal favorites are Koh Kut/Kood and Koh Tao. And if you’re looking for bigger beach spots to use those points, consider places like Koh Samui or Krabi, which have some beautiful points properties but haven’t yet been entirely exploited by tourism. The first time I saw an elephant outside of a zoo, I was in awe. I couldn’t believe how majestic these beautiful, massive creatures were. I understand the intrigue of riding them, bathing them and being around them. But please, consider the animals themselves when participating in this kind of tourism. Many places are ethically correct havens that care for these animals and others are not. Careful research can weed out centers that abuse these animals from ones that respect them. This post on responsible and ethical elephant tourism can help. A good rule of thumb is to avoid any spots where elephants have chairs or chains attached to their backs or do circus tricks like painting. I won’t get into too much detail here, but take care where you go for a Thai massage. Usually, asking your hotel (or friends) for recommendations for spas and massage centers is the best way to avoid any funny business. My favorite places in Bangkok are Hapa Spa and Orchid Massage and Spa (Fiona, the owner, is lovely). You can always take your chances, but try to get a feel for the vibe of the spa before the massage starts as you can usually tell if something is off. Of course, spots where girls stand outside in minimal clothing offering massages should be avoided at all costs. 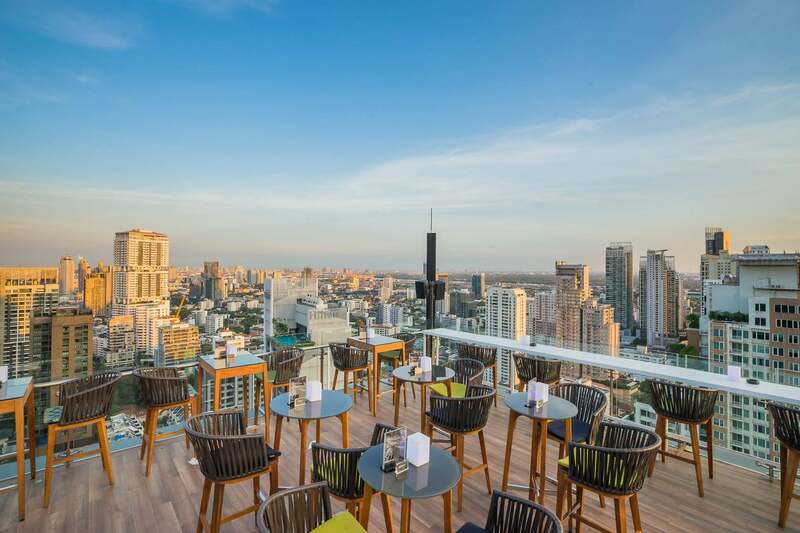 Yes, we know you saw Hangover 2, but these days Bangkok is brimming with fashionable rooftop bars, all of which have very impressive views. Most of them, unlike the Sky Bar, don’t charge approximately $20 for a drink either. So if you absolutely must, visit this bar but consider visiting some other really amazing ones, too, such as CRU, Vanilla Sky, Sirocco, Vertigo, Red Sky, Above Eleven or Octave, just to name a few. This story has been updated with information about Uber and Grab in Bangkok.